The Statute of Basque Autonomy or Statute of Gernika, passed on 18 December 1979, is the basic institutional document that grants the Basque Country the capacity for self-government as a Self-Governing Community. This legal framework, recognised in the Spanish Constitution and which originated in the historical Basque Regional Code of Laws, endorses its political and financial autonomy, as well as certain legislative and executive powers. The Statute confers freedom to act in essential aspects such as taxation and fiscal matters, healthcare, public safety, education and internal territorial organisation, which are some of the powers transferred between 1979 and 2011. However, there is still shared management with Central Government in certain areas, and other non transferred powers, such as Penitentiary Legislation, Labour Legislation, Ports and Airports, Defence and the Armed Forces, etc. 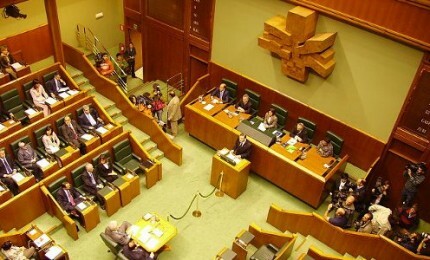 The powers held by the Basque Country are exercised through the Basque Parliament, the Basque Regional Government and the Lehendakaritza or Regional Presidency. The Parliament exercises legislative authority and controls the actions of the Government. Government, in turn, carries out executive and administrative functions, and reports to Parliament through the highest representative of Government and of the Self-Governing Community itself, the Lehendakari or Basque regional president. –Public Administration and Justice: Its functions include organising and coordinating the Basque Public Administrations, working in collaboration with the Basque Institute of Public Administration – IVAP, legally defending the Statute of Autonomy and the Basque Government, as well as guaranteeing the exercising of rights granted to citizens. –Economic Development and Competitiveness: Its main mission is to stimulate economic growth in the Basque Country. To do that, this department rolls out different strategic plans with a view to strengthening and internationalising the Basque business sector, and encouraging entrepreneurship and innovation in search of a competitive productive system. The Basque Energy Body – EVE and the Basque Business Development Agency – SPRI are two of the organisations that help with this task. –Employment and Social Policies: This department is responsible for implementing labour legislation, and for developing employment policies and professional training,in collaboration withbodies such as the Lanbide-Basque Employment Service. It also holds authority in the areas of social economics, housing, social services, work/life balance, children, volunteer work, etc. –Tax and Finance: Its actions focus on drawing up guidelines for the Basque Government’s general economic policy. It is also responsible for monitoring and analysing the economic and financial activity of the Basque Public Sector, Public Administrations and Public Business Sector as a whole. The Basque economic and fiscal system has an important peculiarity worth highlighting, known as the Economic Accord, which allows this region to apply its own fiscal policy that yields competitive advantages. –Education, Linguistic Policy and Culture: This department is responsible for all stages of education and teaching and is in charge of achieving excellence at all levels, particularly in higher education (UNIBASQ)and professional training (TKNIKA). Its mission also entails promoting scientific research, furthering the Basque language, euskera (HABE, Etxepare Euskal Institutua), managing and protecting historic and artistic heritage and disseminating artistic, cultural, and sporting activities, among others. –Safety: Its main areas of action are the safety of people and property, coordinating local police forces, the Basque police – Ertzaintza-, civil protection and emergencies, traffic and road safety, as well as controlling gambling, events and recreational activities. –Health: This department is responsible for establishing and applying the strategic guidelines for Social and Healthcare, the main aim being to “preserve the Basque Health System –Osakidetza– as a public, universal, and quality service” (Strategic Guidelines of the Health Department 2013-2016). –Environment and Regional Policy: This department is in charge of organising territory, coastline and natural resources, the conservation of nature, land, sea, river and cable transportation, among other areas of action. The Environmental Management Public Company – IHOBE, the Basque Water Agency / Uraren Euskal Agentzia, Euskadiko Kirol Portua and the Basque Rail Network – Euskal Trenbide Sarea are a few of the organisations that areaffiliated to this department. Another of the unique characteristics of the Basque Country, within the institutional and administrative organisation of the Self-Governing Community of the Basque Country, are the Diputaciones Forales or Provincial Councils (Diputación Foral de Álava, Diputación Foral de Bizkaia and Diputación Foral de Gipuzkoa). A Diputación Foral is an executive body present in each of the three Historic Territories, which in turn report to the Juntas Generales, or General Assemblies, which are the legislative body. Each Diputación has a Legislative Assembly that votes on the budget and chooses the executive who will govern the Historic Territory, known as the Diputado General. These institutions enjoy high levels of autonomy and a broad array of powers, including tax raising powers, urban planning, roads and public engineering works, the environment, cultural heritage, and social welfare. The association between these institutions and the Basque Government turns this Community into a federal style organisation.